The Luxembourg system is designed with a public tier, as well as voluntary occupational and voluntary personal pension components. In addition to its pay-as-you-go element, the public pension is also partially funded by a reserve fund designed to cope with future demographic challenges. Overall, the domestic pension market is considered small. 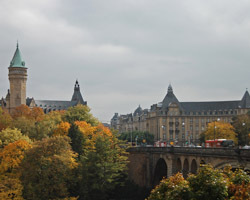 The Luxembourg social security system provides substantial retirement benefits based on two components: a flat-rate amount contingent on years of coverage and an earnings-related amount. Both components are financed through contributions shared equally between the employer, employee and the state, amounting to 24% of wages. The scheme covers all individuals economically active in the public and private sector. The self-employed are also included, although they pay 16% of net taxable income as opposed to the 8% contributed by insured employees. The normal retirement age is 65, provided at least ten years' worth of contributions have been made. Every insured person with a contribution record of at least 20 years is entitled to public pension benefits. After 40 years of contributions (compulsory or voluntary), an individual can claim an early pension from age 57 onwards. The statutory retirement age is 65, but it is possible to continue to work and receive the pensions without suffering a reduction in benefits. have contributed for at least 40 years. The maximum monthly pension is capped at €6,265.25. - SEPCAVs - similar in structure to an investment trust. - ASSEPs - a non-profit making association. In addition, a pension fund can also be created in the form of a non-profit organisation, called ASBL. The SEPCAV (Pensions Savings Company with Variable Capital) is a public limited company. The members (future beneficiaries) are shareholders and own a set number of shares in the SEPCAV according to a net asset value per share, which is calculated on a regular basis. The benefit is calculated as a product of the number of holding shares and the value of shares on the date of the payment. The whole benefit is paid out as a single lump sum. As a result, members benefit entirely from the investment income of the fund, but simultaneously bear the full investment risk. Because of this, SEPCAVs can only be offered as defined contribution (DC) schemes. The minimum capital needed to establish a SEPCAV is €1 million, a figure that has to be reached within two years of authorisation of the fund. A board of directors manages the company and can include a representative from the employer. An ASSEP (Pension Savings Association) is an association so members who do not have direct ownership of assets. Instead, members are creditors and have a claim for payment of benefits against the ASSEP. Consequently, an ASSEP can be used for DC, defined benefit (DB) or hybrid schemes. Depending on the scheme, benefits can be paid as either a lump sum or as an annuity. The minimum capital requirement is €5 million. Both SEPCAV and ASSEP vehicles can be set up as either single or multi-employer funds. They are supervised by CSSF (Commission de Surveillance du Secteur Financier), the Luxembourg banking and investment funds regulator. There are no restrictions regarding investment regulations on these vehicles. Both types of schemes are tax neutral in that taxation takes place at the investor level. Asset management of the pension funds can be outsourced to authorised domestic or foreign asset managers. ASBLs (Association Sans But Lucrative) are intended for larger companies wishing to establish their own pension fund. The ASBL must be administered in Luxembourg and the sponsoring company is required to guarantee the solvability and liquidity of the pension fund at any given time. ASBLs are supervised by CAA (Commissariat aux Assurances), the Luxembourg insurance regulator, as this type of pension vehicle is created under the general provisions of the insurance law. Quantitative investment regulations apply to ASBLs. Rules applied to this legal form are simple and flexible and the pension fund could finance either DB or DC schemes. The pension fund can be "multi-employer" and administer several pension plans. Changes within the tax system mean it is now more attractive for small and medium-sized businesses to offer direct insurance schemes to their employees or to link up with established SEPCAV and ASSEP structures to finance pension plans. Until now, tax disparities between the various vehicles meant that the overwhelming majority of pension plans have been funded via book reserves. Book reserve systems are non-contributory for employees, while employer contributions to any of the three types of pensions schemes cannot exceed 20% of salary.